Kon Tum (VNA) - The Central Highlands province of Kon Tum should focus on developing commercial agriculture, applying high technologies, building a trademark for Ngoc Linh ginseng, and speeding up administrative reform, said the top legislator. National Assembly (NA) Chairwoman Nguyen Thi Kim Ngan made the suggestion at a working session with leaders of Kon Tum province on March 18. Kon Tum is a border province that covers 17.6 percent of the total area of the Central Highlands region. With a population of 520,000, the province is home to 30 ethnic groups. 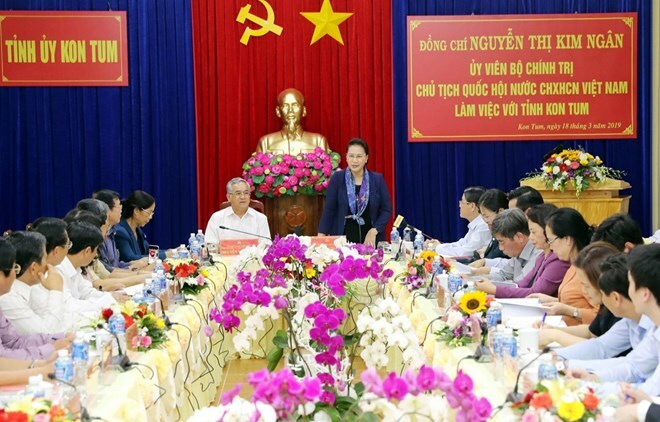 According to Chairman of the provincial People’s Committee Nguyen Van Hoa, Kon Tum has focused on three spheres: urban infrastructure development, agriculture and administrative reform. Ngan lauded the province’s efforts in recording 9.28 percent in GRDP growth in 2018, exceeding the set target, as well as strong performances in budget collection and agricultural development, especially in the plantation of Ngoc Ling ginseng and high-tech agriculture. The top lawmaker noted with pleasure that three key economic zones of the province – Ngoc Hoi, Kin Plong districts and Kon Tum city – attracted 39 investment projects with total registered capital of 508 billion VND (21.9 million USD). However, she pointed out that only 17 out of 102 communes and wards have fulfilled criteria of the new-style rural area building programme, making it difficult to reach the target of 50 percent of the communes completing the criteria in 2020. Ngan recognised Kon Tum’s endeavours to reduce 91 administrative units and 129 officials. But the province has still faced shortcomings in applying scientific advances in production, while the qualifications of human resources has failed to meet development requirements, tourism development has yet to match its potential and the province has lacked material areas. Kon Tum should review its targets and future roadmap to optimize its strengths and potential, while preserving ethnic minority cultures to develop tourism and reduce poverty among ethnic minority communities. Stressing the strategic role of Kon Tum in the region’s political security, Ngan asked the province to well implement plans to ensure national defence, security and social order and safety. Kon Tum should pay greater attention to developing friendship and partnership with Lao and Cambodian localities, she suggested. The NA leader said that Kon Tum should complete dossiers for the establishment of Mang Den town from Dak Long commune in Kon Plong district. She also stressed the need for the urgent implementation of measures to prevent erosion along the banks of Dak Bla River. The same day, Ngan visited the Kon Plong district, where 80 percent of its population are ethnic minority people of Xe Dang, Mo Nam, Ka Dong and Hre groups, and attended the opening of the folk music instrument making festival. Working with the district’s leaders, the NA leader noted that the poverty rate in the district remains high, at 32.55 percent. She advised the district to work hard to preserve cultural identities of the ethnic groups for developing tourism. Kon Plong should take the initiative in attracting investment in tourism to fully tap potential of the Mang Den ecotourism site, she said.